A chronology on "Science from the East - Techniques from the West: Turkey's 700-year long venture" is compiled by Professor Dr. Feza Günergun, Department of the History of Science, Istanbul University. People sought knowledge for centuries long and tried to confirm the knowledge they accumulated through observations and experimentation, and eventually decipher the Laws of Nature. This chronology aims to reflect the mobility of knowledge between Central Asia and Western Europe, throughout a timeline starting in the late 13th century, and reflects the Ottomans’ quest for knowledge both in the ‘East’ and the ‘West’. The major objective is to attract lay attention to history of science and promote efforts for the preservation of material (scientific instruments, documents, software, etc.) pertaining to the history of science and technology. This chronology has been previously published in the catalogue Pursuing Knowledge (ed. 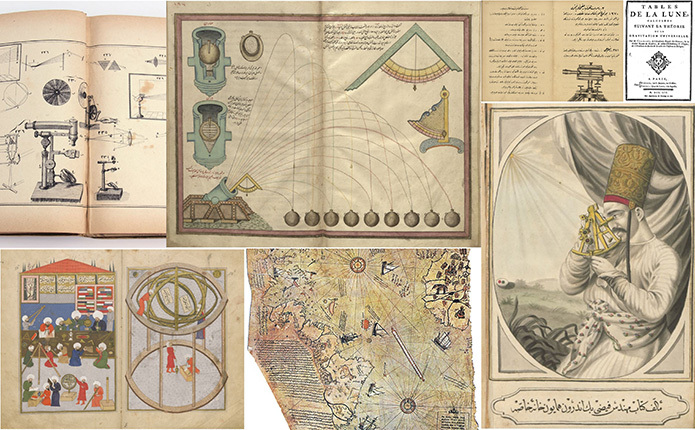 F. Günergun, Istanbul 2016) prepared for the exhibition Pursuing Knowledge Scientific Instruments, Manuscripts and Prints from Istanbul University Collections (Istanbul University, 26 September – 26 December 2016) organised by the Department of the History of Science, Istanbul University, on the occasion of the 35th Scientific Instrument Symposium held in Istanbul University on 26-30 September 2016 in collaboration with the Scientific Instrument Commission (SIC) of the International Union for the History and Philosophy of Science and Technology (IUHPST). 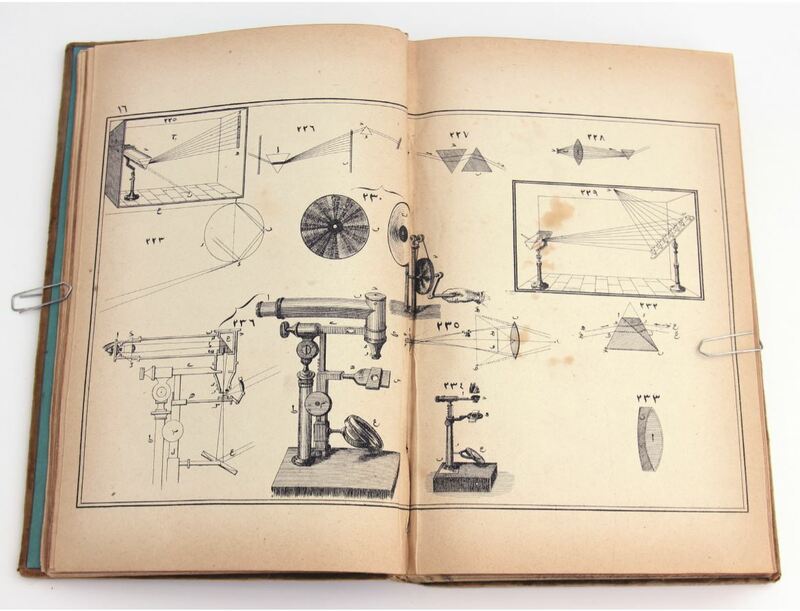 Image copyrights of items from the collections of Istanbul University’s Rare Books Library, Faculty of Science and Geology Museum belong to the Istanbul University. Image copyrights of items from private collections belong to their respective owners. Turn of the 14th century - The Ottomans establish their principality in Western Anatolia. 1331 - First Ottoman madrasa in Iznik (Nicea) with the sufi scholar Davudü’l-Kayseri as headmaster. 1400 - First Ottoman hospital (darüşşifa ) in Bursa. 1421 - Qādi Zādā al-Rumī, a scholar from Bursa in Western Anatolia, completed in Samarqand his commentary on Shams al-din al-Samarqandi’s (13th c.) Ashkāl al-ta’sīs discussing theorems selected from Euclides’s Elements. Qādi Zādā’s commentary on Sharh Ashkāl al-ta’sīs became very popular in Ottoman medreses and had long lasting effects on the teaching of mathematics in Turkey. It was to be translated into Turkish at the end of the 18th century (ON DISPLAY). 1465 - Ptolemy’s Geography (2nd c.) was rendered from Greek into Arabic by Georgios Amirutzes at Fatih Sultan Mehmed’s behest. 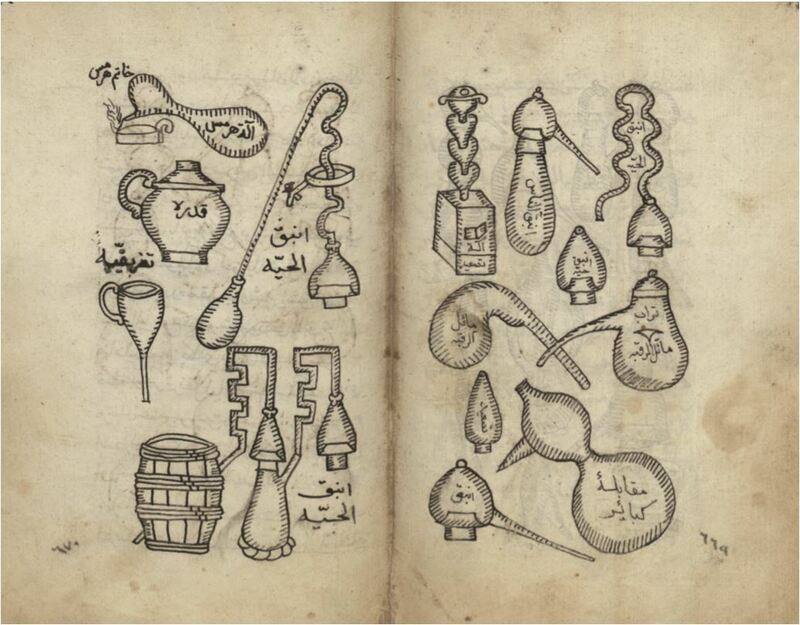 1465 - Sabuncuoğlu Şerefeddin, a physicians from Amasya, translates the sections on surgery and surgical instruments of Kitab al-tasrif, the encyclopeadic work of the Andalusian physician Abu al-Qāsım Zahrāwī. The Turkish text is titled Cerrahiyetü’l-haniyye (Surgery of the khans). 1471 - Fatih Madrasa is inaugurated in Istanbul. The coming of Ali Qushji from Samarqand to Istanbul. 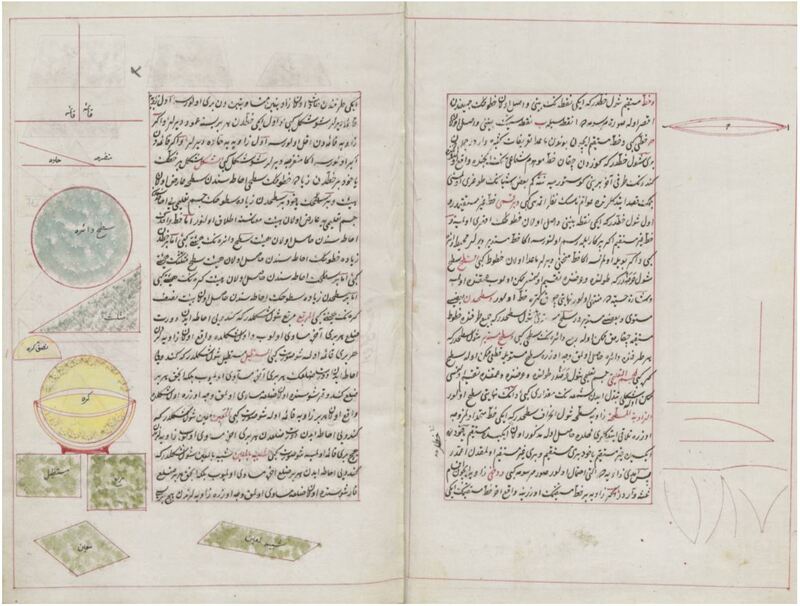 1472 - Ali Qushji completes his astronomical work al-Fathiyya (The conquest) which will become one of the most revered astronomy book among Ottoman scholars up to the 19th century. 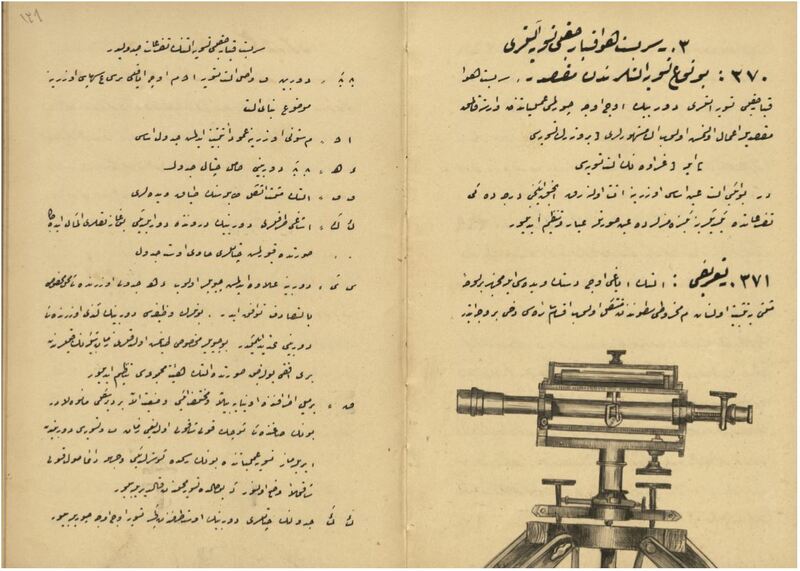 A summary in Turkish was made by the chief-instructor of the Imperial School of Engineering by Seyyid Ali Pasha and printed in Istanbul in 1823-24 with the title Mirat-ı âlem (Mirror of the universe). 1492 - The first Hebrew printing press in Istanbul. 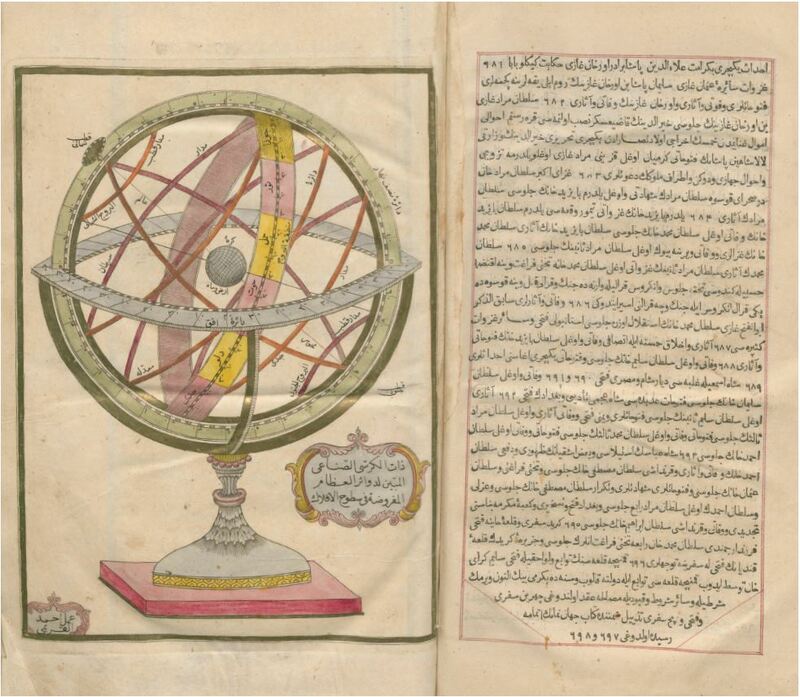 1499-1525 - Mirim Çelebi completes his commentary of Ulugh Beg’s Zij and compiles his books on astronomical instruments and mathematics in Persian and Arabic. 1513 - Admiral Piri Reis composes a world map by making use of some 22 maps, including Christopher Colombus’s map. 1515 - The enlarging of the small shipyard in the Golden Horn is completed. The new arsenal with its 300 docks becomes the administrative and technical centre of the Ottoman navy. 1521 - Piri Reis completes his opus magnum Kitab-ı bahriye (The Book of seafaring) as a guidebook to mariners, including over 500 maps depicting the coasts of the Aegean Sea and the Mediterranean. 1528 - Piri Reis’s second world map. 1537 - Nasuh al-Matraki completes his geography book Beyan-ı menazil-i sefer-i ırakeyn with miniature illustrations and descriptions of the towns in which the Ottoman army camped during the 1533-36 Persia campaign on the way from Istanbul to Tabriz and back. 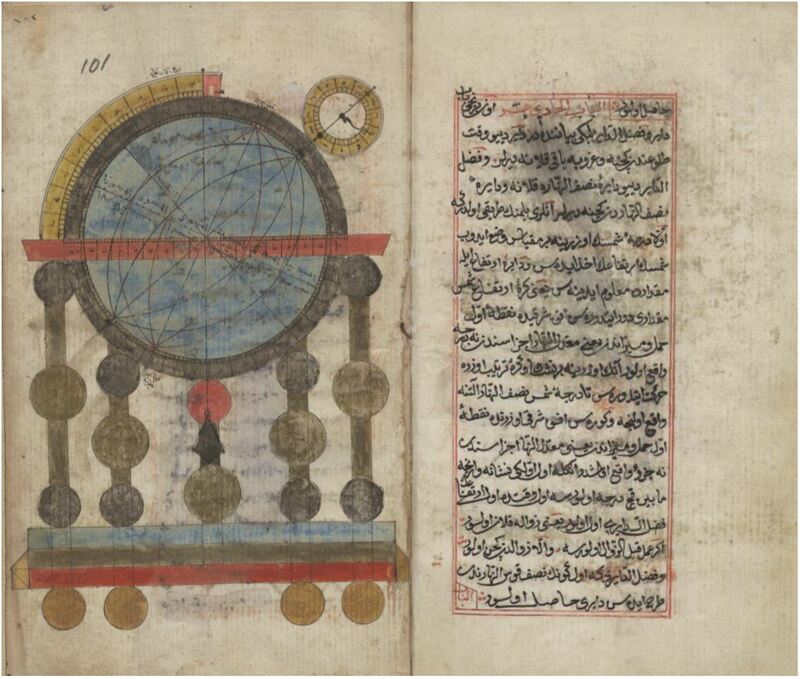 1549 - Admiral Seydi Ali Reis renders the astronomy book al-Fathiyye of Ali Qushji into Turkish under the title Hulasatü’l-hey’e (Epitome of astronomy). 1554 - Seydi Ali Reis’s Kitabü’l-muhit (The book of the ocean) a guide for the mariners in the Indian Ocean. 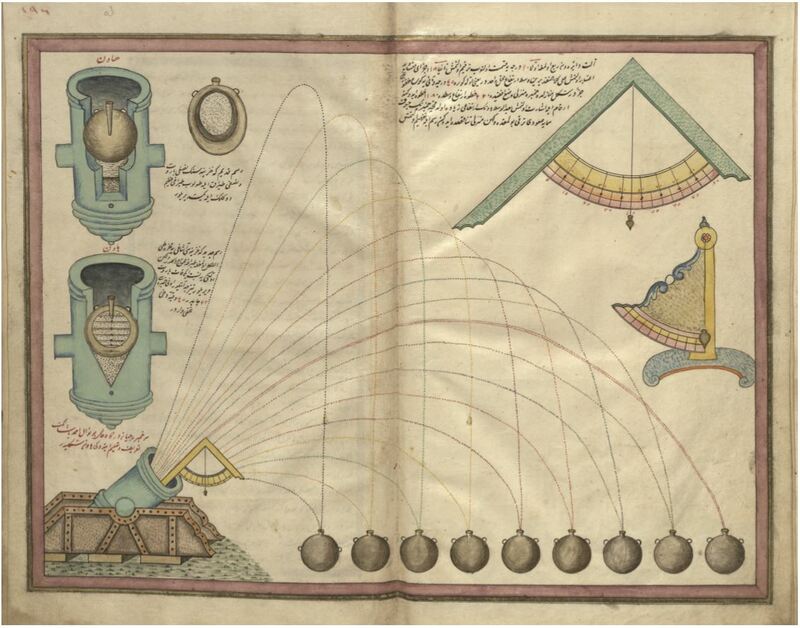 Before 1563 - Seydi Ali Reis, in Mirat-ı kâinat (The mirror of the universe), introduces and details the astronomical instruments and methods used in navigation. (ON DISPLAY). 1556 - The opening of the first medical school (Süleymaniye medical medrese) in Istanbul, formalizing medical education given in hospitals. 1567 - The first Armenian printing press established in Istanbul. 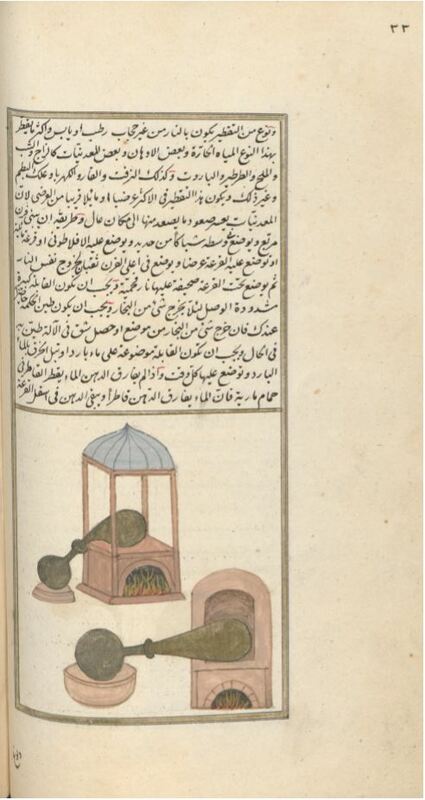 1575 - Takiyüddin (Taqi al-Din) starts his observations at the observatory he created in Istanbul to improve Ulug Beg’s Zij compiled in the 15th century in Samarqand. Built with the financial support of Sultan Murad III, the obervatory’s instruments are depicted and described in Alât rasadiyye li zic el-şehinşahiyye (The observational instruments for the astronomical tables of the shah of the shahs, 1649-50) (ON DISPLAY). 1580 - The demolishing of the Takiyüddin’s observatory. 1627 - The first Greek printing press established in Istanbul. 1632 - Şemseddin Itaki introduces European anatomical knowledge of 16th century to the Ottoman sphere of learning with his Risale-i teşrih-i ebdan (Treatise on the anatomy of human body). Kâtip Çelebi’s Cihannüma (Cosmorama) paves the way. 1655 - Kâtip Çelebi and Ihlasî Mehmed Effendi translate G. Mercator’s Atlas Minor into Turkish. The translation is entitled Levami el-nur fi zulmet-i Atlas Minor (Illuminating the obscurities of Atlas Minor). 1663 - The introduction of the Copernicus’s heliocentric system through the translation of Nathalis Durret’s astronomical tables into Arabic and Turkish. The translator was the Köse Ibrahim Effendi of Szigetvar. 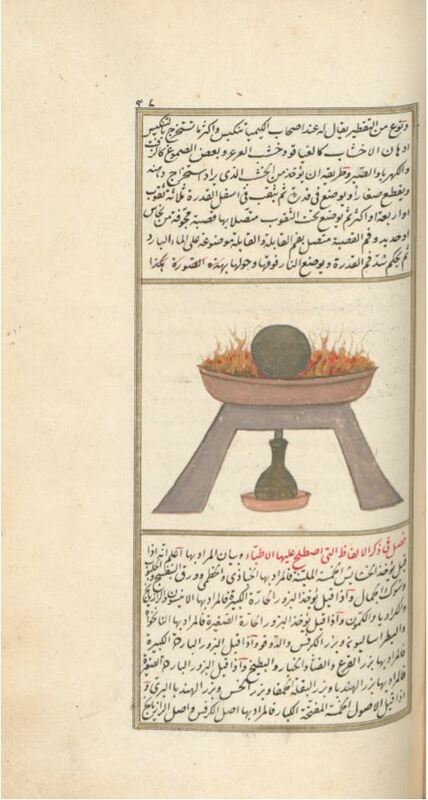 1664 - Salih bin Nasrullah of Aleppo, the personal physician to Sultan Mehmed IV, writes his treatise about the iatrochemical therapies in Arabic: Gayet al-itkan fi tadbir badan al-insan (Perfection in the treatment of human body) (ON DISPLAY). 1675-85 - Ebu Bakr al-Dimashqi’s translation of Joan Blaeu’s geography book Atlas Maior into Turkish. 1720-21 - Yirmisekiz Mehmet Çelebi, the Ottoman ambassador in France visits the Paris observatory, military institutions and industrial workshops. 1727 - The first press to print Turkish books with Arabic characters is founded by Ibrahim Müteferrika and Mehmed Said Effendi in Istanbul. 1730-54 - The Italian general Raimondo Montecuccoli’s work on military techniques is partly translated into Turkish (ON DISPLAY). 1732 - Ibrahim Muteferrika publishes Kâtip Çelebi’s geography book Jihannuma by adding information from of Joan Blau’s Atlas Maior (ON DISPLAY). 1735 - Early initiatives to re-model the Ottoman army after those of European powers: Mathematics courses are given to the 300 bombardiers in the Üsküdar Barracks under the supervision of Comte de Bonneval. This program was not sustained and the Corps of Bombardiers was reorganised in 1792. 1741-42 - The Ottoman ambassador Mehmed Said Effendi visits in Paris the scientific institutes and the shop of Nicolas Bion, the scientific instrument maker. He orders various scientific instruments including an eclipse calculator. 1748 - Mehmed Said Efendi commissions the mathematician Mehmed Sıdkı Effendi to translate a booklet accounting for the use of the eclipsarium designed by De La Hire. 1761-66 - Avicenna’s Kanun fit’tıbb (The Canon of Medicine), which was highly esteemed by Ottoman physicians, is rendered from Arabic to Turkish by Mustafa Effendi of Tokat. 1767 - Halifezâde Çınarî Ismail Effendi, the timekeeper of the Lâleli Mosque in Istanbul, translates into Turkish Alexis Claude Clairaut’s work Tables de la Lune (1754). 1772 - Halifezâde Çınarî Ismail Effendi, translates Jacques Cassini’s Tables astronomiques (1740) to Turkish. The translation of the logarithmic tables preceeding the astronomical data, provided for the introduction of logarithms into Turkey. 1773 - The dervish-physician Ömer b. Sinan of Iznik (Nicea) compiles Şifa el-Müminin (Health for the believers), introducing iatrochemical therapies to the Turkish readership (ON DISPLAY). 1773 - A cannon foundry opens in Hasköy on the Golden Horn, under the supervision of Baron François de Tott. European type cannons were cast with European machinery and masters. 1775 - A School of Geometry (Hendesehane) founded on the premises of the arsenal at the Golden Horn, to train officers knowledgeable in mathematics and geography. Supervised by Baron de Tott, this school was transformed into “The Engineering School of the Arsenal” in 1781; and subsequently “The Imperial School of Naval Engineering” in 1806. 1782-88 - French engineers and experts are employed in the Engineering School of the Arsenal, contributing to shipbuilding and further technical education. 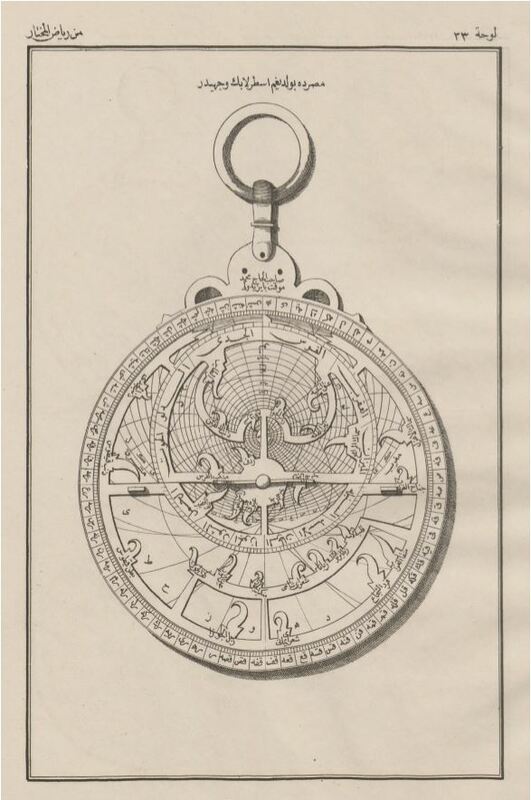 Engineer Feyzi Effendi’s compendium on the sextant used for measuring altitudes (ON DISPLAY). French to Turkish upon the order of Sultan Selim III. 1795-97 - The School of Engineering (Mühendishane) is founded within the Barracks of Bombardiers at Hasköy on the Golden Horn, to train military engineers for the army re-organized by Sultan Selim III. This school will later be named “The Imperial School of Engineering”. 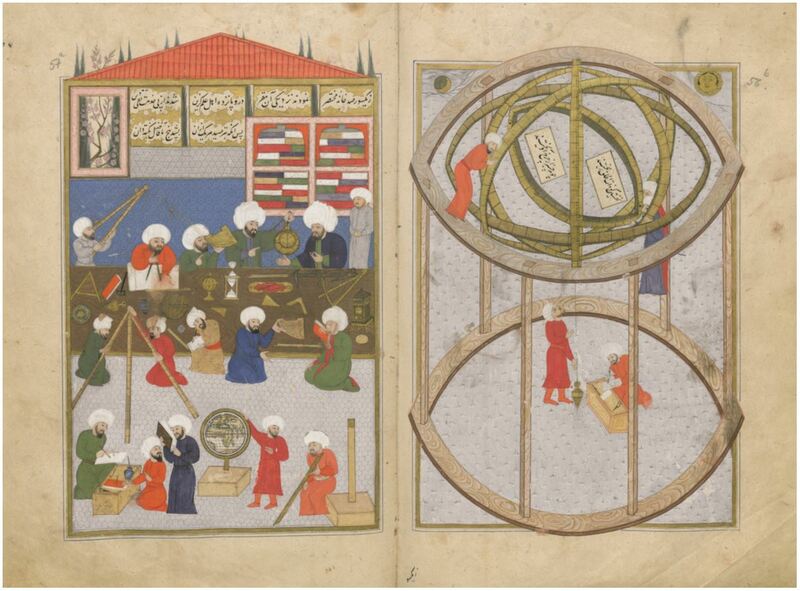 1800 - Astronomical tables of Jacques Cassini replace Ulugh Beg’s Zij in computing calendars in the Ottoman Empire. 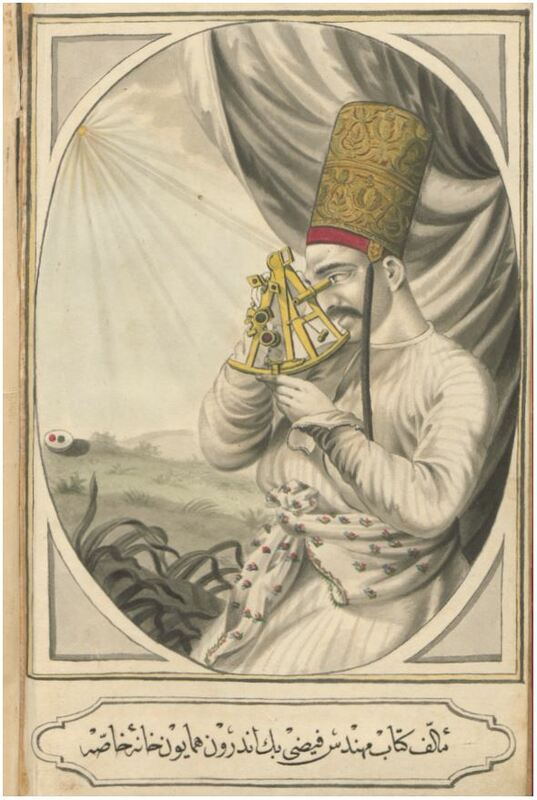 1806 - The chief-astrologer/astronomer Hüseyin Hüsnü Effendi translates into Turkish the chapter on calendar computing in Jérôme Lalande’s astronomical tables: Terceme-i Zic-i Laland. 1807 - The Janissary reaction and destruction of the modern army established in 1793 by Sultan Selim III. 1826 - Abolition of the Janissary corps by Sultan Mahmud II. 1827 - The opening of Tıphane-i Amire, a modern military medical school. 1830 - Four young ottomans mentored by Admiral Hüsrev Pasha are sent to Paris to be trained in military sciences. 1834 - Graduates and officers of the Imperial Engineering School sent to Europe with state funding to further their technical education. 1834-1840 - Dervish Effendi (later pasha), a graduate of the Imperial Engineering School, leaves for Europe to study at the École des Mines. 1834-35 - The opening of the Military Academy in the Maçka barracks. A demonstration hall for instruments (Âlat-ı fenniye) is created (ON DISPLAY). 1837 - The construction of the first steam ship (Eser-i hayr) in the Aynalıkavak Arsenal, Golden Horn, under the supervision of the American engineer Foster Rhodes. 1839 - Proclamation of the Reform Edict (Gülhane Hatt-ı Hümayunu) by Sultan Abdülmecid I, calling for the social administrative and political reorganisation of the state. 1839 - Re-organisation of the military medical school by the Austrian physician Carl Ambroise Bernard, at the Galata Seraï as the Mekteb-i Tıbbiye-i Şahane (Imperial Medical School). The instruction is in French. 1839-42 - Dr. Bernard and the botanist Skálák from Vienna created the first botanical garden within the Imperial Medical School. 1842 - The opening of the first military veterinary school. 1844 - The German pharmacologist Wilhelm Noë establishes the first herbarium within the Imperial Medical School. 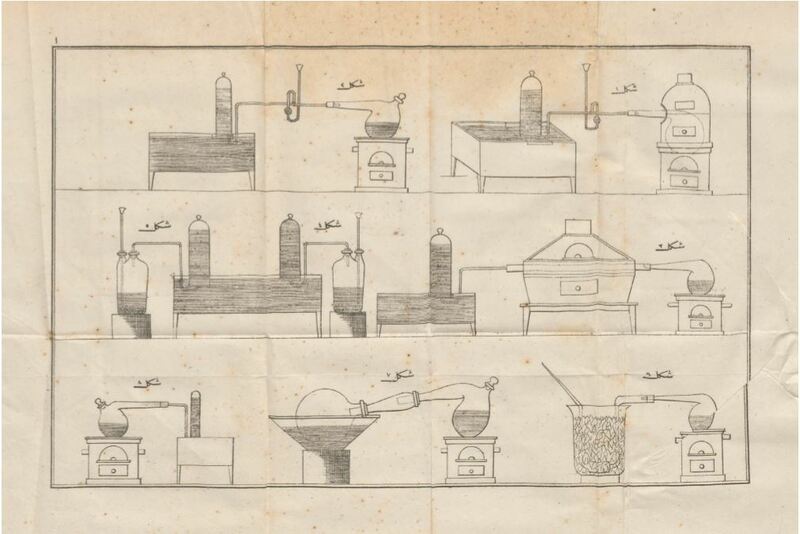 1844 - Steam engine in use in textile production in the Fez Factory (Feshane). 1847 - The opening of the School for Agriculture (Ziraat Mektebi) to teach cotton cultivation. 1847 - The publication of the first chemistry textbook in Turkish: Derviş Pasha’s Usul-i Kimya (Elements of Chemistry) (ON DISPLAY). 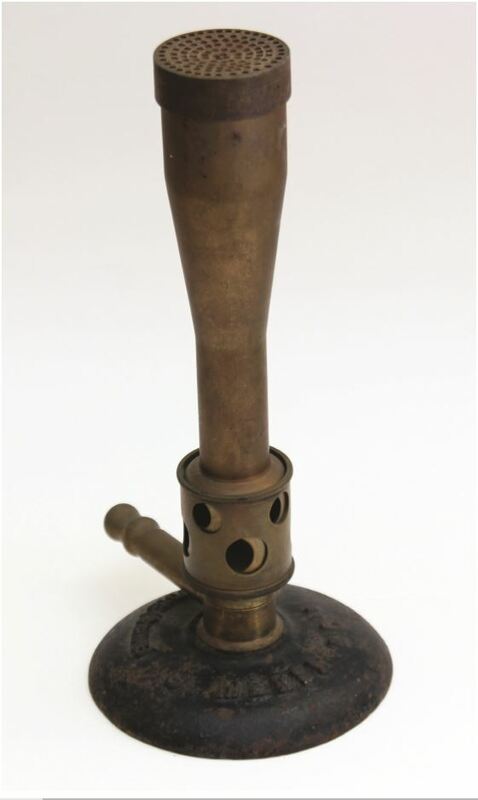 1849 - The first medical journal in Turkish: Vekayi-i tıbbiye (Medical Clinics). 1855-56 Telegraphic lines put into service. 1856 - Proclamation of the Reform Edict (Islahat Hatt-ı Hümayunu) by Sultan Abdülmecid I authorising equality of all citizens under the law, and granting civil and political rights to all Ottoman subjects regardless of creed and nationality. 1856 - The first Ottoman Imperial Medical Society (Cemiyet-ı Tıbbiye-i Şahane) is founded at the end of the Crimean War by the European physicians of the allied armies in Istanbul and the non-Muslim ottoman physicians. 1857 - The publication of the Gazette médicale d’Orient in Istanbul. 1857 - The arrival of two forest engineers from France. A forest school teaching in French opens. The early graduates are produced in 1861. 1860 - First railway connecting the province of Aydın and the Izmir port. 1861 - The foundation of an Ottoman learned society, the Cemiyet-i İlmiye-i Osmaniye with the initiatives of Münif Paşa. The publication of Mecmua-i Fünun, the first popular science journal in Turkish (1862). 1863-65 - The opening of Darülfünun (Ottoman university). Lectures are given for two years long. 1865 - The first physics textbook in Turkish by Derviş Pasha (ON DISPLAY). 1867 - The publication of the first popular Turkish journal in mathematics: Mebahis-i ilmiye. 1867 - The opening of the civilian medical school, Mekteb-i Tıbbiye-yi Mülkiye. Instruction in Turkish. 1868 - The establishment of a meteorological observatory, Rasathane-i Amire, in Istanbul. 1868 - The opening of an industrial vocational high school (Mekteb-i Sanayi) in Istanbul through the initiatives of Mithat Pasha. 1870 - The re-organisation of the Natural History Museum of the Imperial Military School by Dr. Karl Eduard Hammerschmidt (alias Abdullah Bey the Hungarian), professor of zoology and geology (ON DISPLAY). 1876 - The proclamation of the First Constitution. 1876 - A. Gırcikyan translates A. Ganot’s Traité de Physique in Turkish. The 2nd edition (1886) of İlm-i Hikmet-i Tabiiyye is on display. 1884 - The opening of the civilian school of engineering, the Hendese-i Mülkiye Mektebi. 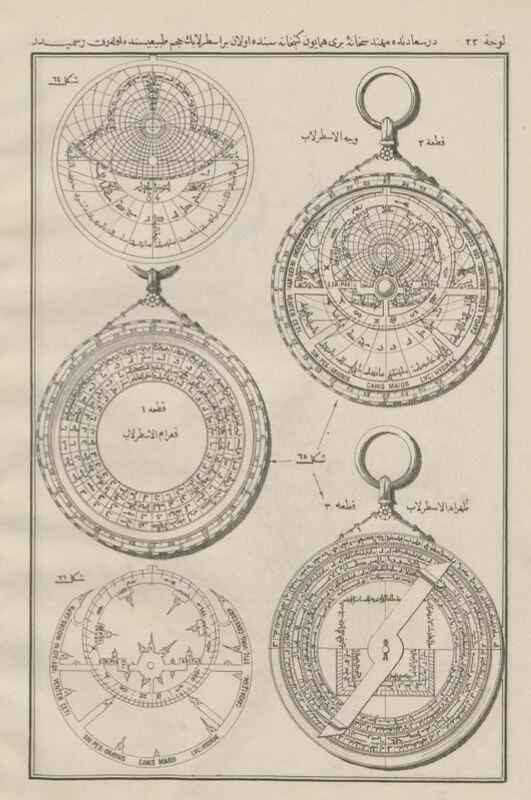 1885/6 - The publication of Gazi Ahmet Muhtar Pasha’s Riyazü’l-muhtar (Muhtar’s garden) in Bulaq, accounting for the traditional Islamic timekeeping instruments (ON DISPLAY). 1889 - The opening of the first civilian veterinary school. 1893 - The opening of the Imperial Bacteriology Institute with cooperation with the Pasteur Institute (Paris). 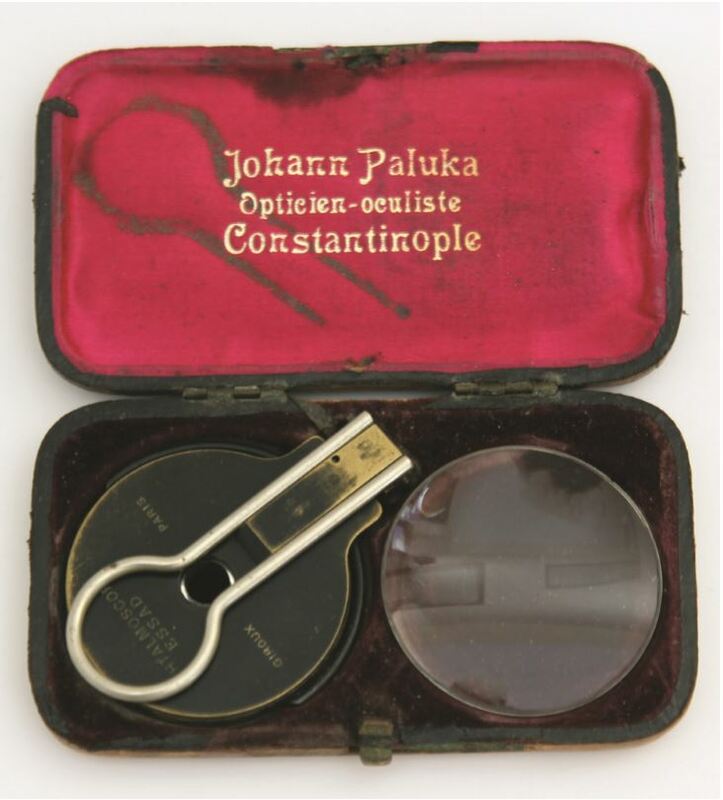 1893 - Dr. Esat Işık Pasha designs his “Ophthalmoscope Essad” for fundus examination of the eye (ON DISPLAY). 1897 - First X-Ray examination is made by the military physician Esad Feyzi at Greco-Ottoman War. 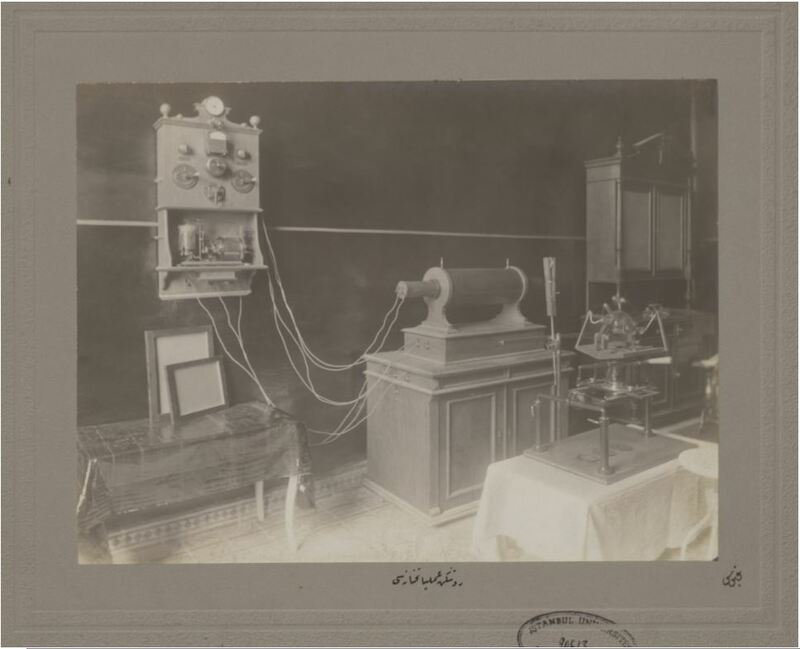 1903 - The establishment of an x-ray room in the Imperial Medical School (ON DISPLAY). 1908 - The proclamation of the Second Constitution. 1910 - The foundation of the Kandilli Observatory. 1914 - Silahtarağa Power Station, a coal-fired electric generating station opens in Istanbul. 1914-18 - World War I. The coming of German professor and technicians to the University (Darülfünun). 1917 - The foundation of the institutes of chemistry in the Faculty of Science, Darülfünun under the supervision of German professors (ON DISPLAY). 1919-1922 - Turkish War of Independence. 1923 - The proclamation of the Turkish Republic. 1925 - The establishment of the first station for seed improvement in Eskişehir, aiming to conduct researches to cultivate plants suitable for Turkey’s climatology. 1926 …. - The sending of students to European universities by the Turkish Republic for training in engineering, applied sciences and social sciences. Following the WW2, students were dispatched to American universities. Back to Turkey they were instrumental in the running of newly founded industrial plants and educational institutions, and in the implementation of modern science and technology in Turkey. 1927 - The first radio broadcast. 1928 - Latinization of the Turkish alphabet. 1928 - The foundation of the [Refik Saydam] Hygiene Institute in Ankara. 1933 - The abolishment of the Darülfünun in the process of the Atatürk University Reform and the re-establishment of the Istanbul University. The appointment of German scholars. 1933 - The foundation of the Higher Institute for Agriculture in Ankara and the appointment of German scholars. In 1948, this institute became the Agricultural Faculty of Ankara University. 1933 - The foundation of the Mineral Research and Exploration Institute (MTA) in Ankara. 1935 - The telescope building of Kandilli Observatory in service. 1935 - The creation of a botanical garden in the Faculty of Science of Istanbul University by Alfred Heilbronn and Leo Brauner. 1936 - The opening of the Istanbul University Observatory with the setting of a tri-telescope system. 1939 - Adnan Adıvar publishes La science chez les Turcs ottomans in Paris. 1942- Aydın Sayılı, submits the first PhD Thesis on The Observatory in Islam and its Place in the General History of the Observatory in the postgraduate program in History of Science at the Harvard University established by George Sarton. 1946 - PhD thesis becomes compulsory in universities. 1949 - The setting of a Cockcroft-Walton particle accelerator in the Faculty of Science, Istanbul University. 1952 - The first television broadcast in Turkey by the Istanbul Technical University. 1955 - Turkey signs a cooperation agreement with the USA within the framework of the Atoms for Peace program. 1956 - The foundation of the Atomic Energy Commission affiliated to the Prime Ministry. 1960 - First computers (IBM-650) in Turkey are used by the General Directorate for Highways. 1961 - The first locally designed automobile ‘Devrim’ (Revolution) is produced. 1962 - Turkey’s first research reactor (TR-1) becomes critical at the Çekmece Nuclear Research and Education Center (ÇNAM). 1963 - Scientific and Technological Research Council of Turkey (TÜBİTAK) is founded in Ankara. 1963 - The opening of the Ankara University Observatory. 1963-65 - The construction and opening of the Ege University Observatory. 1974 - The National Seed Bank is created to preserve genetic diversity. 1933 - Access to internet in Middle East Technical University (METU). 1993 - The foundation of the Turkish Academy of Sciences (TÜBA) in Ankara. 1995 - The opening of the TÜBİTAK National Observatory in Antalya. 2015 - The Turkish scientist Aziz Sancar received the Nobel Price in Chemistry in recognition of his researches on DNA repair mechanisms he has been conducting in the USA since 1971. Did Muslim Rulers play a part in the decline of Muslim Civilisation?